Discussion in 'JS Plugin Releases (RMMV)' started by Archeia, Nov 17, 2015. Tired of RPG Maker MV's Map Editor? Do you want to map the XP way but more? Want to do round corners? Want to create a map with basically unlimited layers? Well, now all those worries are gone! 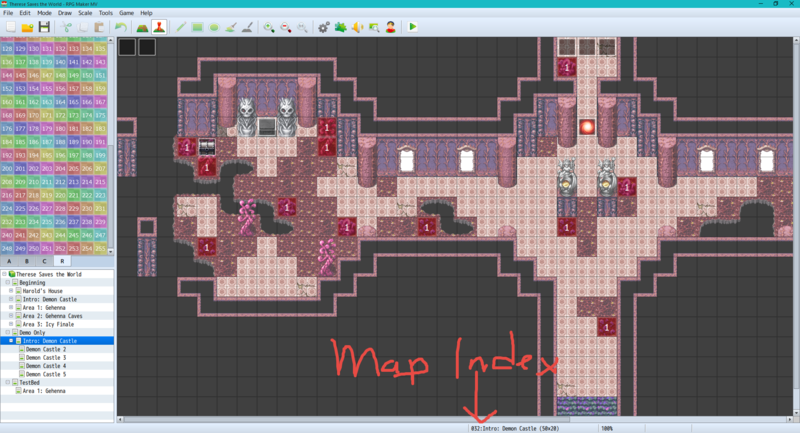 Instead, let's just use the awesome map editor, TileD! Free, easy to use and very flexible Map Editor. This is one of our reveals for RMMV's release but due to unforeseen circumstances, we were unable to showcase this really awesome plugin in RPG Maker Channel. In case it's not obvious, Tiled is a separate program created by Bjorn. Please read the PDF before you attempt to use this plugin. Make sure to use Tiled 1.0.3 since the latest JSON format is ruining this plugin. Instructions included with the zip file! Create a New Folder named **maps** (without asterisks) inside game project's root folder. 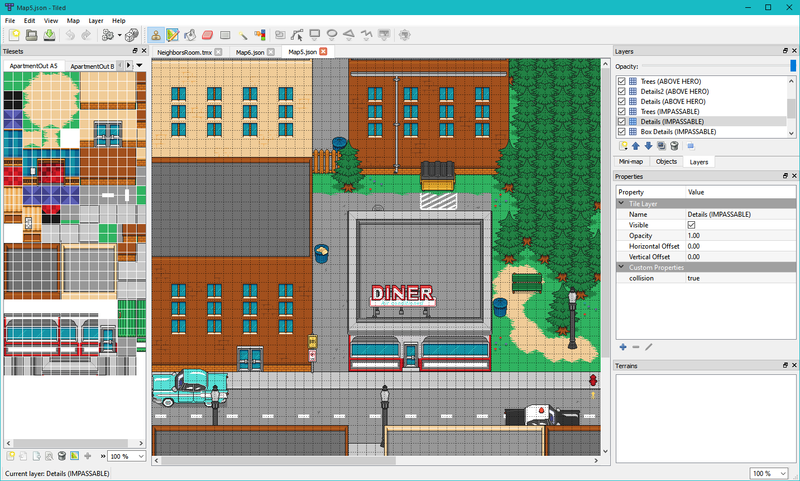 Create a new map in TileD. The settings must be CSV and Orthogonal. The Tile size you set will be the grid in the game! When loading your images, make sure to reference them all in the game's **img/tilesets** folder. Export as json file and make sure that the filename is Map*ID*.json. ID being the map's index as seen in the editor. DO NOT ADD "00". Put all json files from Tiled into the **maps** folder. Put all tilesets into the game's **img/tilesets** This is a reminder! Put `<position: X, Y>` into an event comment box for positioning. For collision: any Tile Layer with *Custom Properties* (in Tiled) `collision` with value `true` has collision. Which mean any tile that is not empty in that Layer will have collision. You can turn off Visible for Collision Layer if you want. For Region ID: any Tile Layer with *Custom Properties* (in Tiled) `regionId` with value is number will make any tile that is not empty has a region ID of entered number. You can turn off Visible for Region Layer if you want. For parallax: add *Custom Properties* (in Tiled) `parallax` with value `true` to Image Layer. Add *Custom Properties* `planeX` and `planeY` for parallax moving. For arrow passable: add *Custom Properties* (in Tiled) `arrowImpassable` with value `up` `down` `left` or `right` to Tile Layer. Any tile that is not empty on that layer will make the *direction* based on `arrowImpassable` value impassable. To make a bug report, simply report it in this thread. Chances are, I will find out about the bug in this thread than by making one in the JS Support forum. We're super busy and we won't have time to do compatibility fixes or checks AT ALL. Please test it out yourself and ask the respective scripter for any issues that may happen. Press F8 when you receive it to open up the debug console. On the console tab, copy/paste the error log and paste it here. If you post a screenshot, host it on imgur.com or another website because the images posted here are tiny and I can't read it. How to Replicate Bug: In order for me to fix a bug properly, explain to me IN DETAIL, how you managed to get it to occur. If I cannot replicate the bug, I may ask you to upload a copy of your game's project for me online through either Mediafire, Dropbox, Mega.co or any other online hosting provider. Do NOT deploy the game. After doing so, it's best if you send it through private message if you don't want others rummaging through your game's files. Other: Post screenshots of the bug, screenshots of your plugin list, videos also help, etc. Anything that will make it more clear for me will help me out. Juanita Star, Jojozaamaak, Pastel_Panda and 81 others like this. ALTERED STATE ?, Seriel, DoctorMolotov and 2 others like this. Now we can use 8x8, 16x16, 32x32, 48x48 or whatever for our games! Benny Jackdaw, Jeysonmcfly, Fornoreason1000 and 4 others like this. djDarkX, Yanfly and Archeia like this. Dr.Yami and Yanfly like this. How is event collision handled? Is it still based on a single tile, or did you already include a script for larger collision area? Forgot to say: Wonderful plugin! The event collision is pretty much the same. If your tile grid is 16x16 the collisions are all 16x16. We haven't touched anything that major in case of incompatibility issues. Ah, I see. In this case my EventHitboxes plugin may come in handy too. Such epicness is normally impossible! I must learn your secret! Tell me how one breaks these rules of reality to be able ascend to your level! Now if only there was a way to streamline the event positions so you do not need to use notetags (but such power could doom all of humanity in and of itself). I have never cried so hard before as I have now. 10/10 - would praise again. Chickenlump and Archeia like this. Finally, saw the editor in live stream and so far there weren't a proper tutorial, I experimented with it, but later I gave up, because my workflow was much slower. Now I can take another look onto this tool. Knowing this plugin existed is the entire reason I was excited for MV. Thanks Archeia and Yami! GrandmaDeb, djDarkX and Archeia like this. Thanks for doing this Archeia and Yami! Great addin, I am trying this out. for the rpg game editor? "ID being the map's index as seen in the editor." I'm going to assume MV, as maps have IDs. One question: How's the compatability? I use "BindPicturesToMap" and "KausUltimateOverlay" already. Has this one created any problems with them?